There seems to be an outburst of appreciation for handwritten notes and postcards right now. Maybe it's because, as MarketingProfs pointed out, our email inboxes are battlefields, crowded with junk. Or it could be nostalgia for the way we used to be, as Lifehack found when it wrote about the joy of the postcard. We all know we should be writing notes and postcards, especially to our donors, volunteers, and supporters. But it is a habit that we have to practice. There are lots of reasons to write thank you notes. Handwriting postcards or letters give the message a memorable touch that will connect you to your audience. 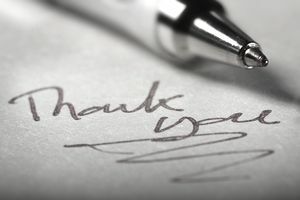 Thank a long time donor: Handwritten thank yous are particularly nice for existing donors. A loyal donor has seen a lot of your material, and a formal letter at this point might seem like just more of the same. Try using a note just to say, "Thanks, we appreciate all that you do." Or use a handwritten note for a lapsed donor. Just say, "We miss you." Thank a volunteer: Sometimes we take our best volunteers for granted. Try thanking those special people with a handwritten note or postcard at least once a year. You might time it after the volunteer has done something especially nice, but any time is the best time. Also, write a handwritten thank you to a few of your "superheroes." Those are the people who consistently talk you up, lead fundraising campaigns on your behalf, and are the first to show up when there is an emergency. Thank the people who RSVP to your event: Send a handwritten note to the individuals who have said they are coming to one of your events. It can serve both as a thank you and a reminder. If there are hundreds of people coming, just pick a few. Simply say, "Thanks for your RSVP to the gala! We're so looking forward to seeing you there." Celebrate milestones: Do you make a note of your best donors' anniversaries or birthdays? How about when they retire? Have they gotten a promotion or a new job? Did their child just graduate from high school or college? These are fantastic opportunities to get in touch and show your donors how much you pay attention and care about them. Thank a business partner or sponsor: Who was the point person on that last cause marketing campaign, or who took the lead for that company's event sponsorship? You may have sent a formal letter to the company with the results of your event or campaign, but take an extra few minutes to send a handwritten note to the person who helped the most. It can pave the way for future collaborations. Thank a reporter or blogger: If a journalist has written or blogged about your charity, this is your chance to turn them into a supporter. Send a handwritten note saying thanks. Also, offer to be a source for future articles, and not just about your charity. Journalists always need expert sources on issues. You could be that. But nurture the relationship by saying thanks. Make writing thank you notes or postcards a habit. It doesn't matter much if you only remember to do it once in a while. Get in the habit of recognizing "thanking moments" and make it easy to follow through. Order up some note cards with your logo: Make them large enough that you can write a reasonable message, and so they will stand out when arriving in the mail. Get postcards that have one of your most iconic photos on it. Have several versions of the postcard made up so that you won't be sending the same ones over and over to the same people. Collect physical addresses, not just emails, of your contacts: We don't do that so much anymore. We have phone numbers and email addresses but forget about physical ones. Your donor and volunteer databases will have them for the people closest to your charity, but don't forget them for people farther afield. Try to get into the habit of collecting them for most people. Set specific goals: For instance, write one thank you per a day or three a week. The actual frequency is less important than that you set a goal for yourself. At the end of the day or week, ask yourself about the notes you've written. Become a role model for the rest of your staff by letting them know that you are writing notes and encourage them to do so as well. Enlist members of your charity: Writing thank you notes to donors is an excellent way to get board members engaged in fundraising. And most volunteers love writing thank you notes. Have a thanking party where they can get together and write them. That works especially well around the holidays or right after the first of the year. There's nothing that can match a handwritten thank you from one of your charity's clients. Children's drawings with a thank you are powerful. One Habitat for Humanity chapter asks its new homeowners to write to donors about how much their home means to them. DonorsChoose has teachers who receive help send a thank you note to donors, plus photos of the children in that classroom. Include a thanking component in everything you do: After events, after fundraising campaigns, as a follow-up to grants both requested and received. Watch for announcements of promotions, retirements, and marriages. These all make wonderful thanking or congratulating opportunities.